2011: Tuddenham St Mary was one of the last half dozen or so Suffolk churches I'd visited back in 2003, and coming back hadn't been a priority, especially as getting in that time had been such a palaver. As with a couple of other accounts on this site from that time, there is something of a demob-happy mood to the article: in truth, I already had the scent of Norfolk in my nostrils. Over the years, the Suffolk Churches site has become a historical blog of kinds, and so I am reluctant to alter the original entry, particularly as it made a couple of general points that I think are still of relevance, not to mention a couple of rather idiosyncratic contemporary references! What I will add here is that this church was taking part in Open Churches Week 2011, and I found it very welcoming. There is a keyholder notice for other times. 2003: We fell silent in the car as we headed out of Cavenham. I was conscious that we were entering the orbit of Mildenhall, and I could taste the bad karma in the air. The road twisted and turned, a sign that we were still on the edge of the heathland, and around a wide curve appeared the stubby west tower of Tuddenham church. We pulled to a halt on the road immediately to the west of it, and gazed up at the west tower, with its fine Decorated detailing. I had warned DD that the chances of us finding a church open in the Mildenhall area were about the same as those of Ian Duncan Smith becoming the next Prime Minister, and my statistical analysis was not to be skewed by Tuddenham. It was locked, even the porch, and there was no keyholder and no sign of any possible welcome for pilgrims and strangers. The heartily evangelical notices on the board outside were all of a piece with this. DD observed that the porch could easily have been opened with a hefty kick, and we were tempted for a moment. But that wouldn't get over the problem of the inner door. However, I had expected something along these lines, and had a cunning plan. From the diocesan website I had taken down the names, addresses and telephone numbers of everyone even remotely connected with Tuddenham parish - the churchwardens, the treasurer, the PCC secretary, the representative on the board of diocesan finance, the lady who does the flower rota - the lot of them. Admittedly, many of these people double up, but I still had a list of four names. I started with one of the churchwardens. 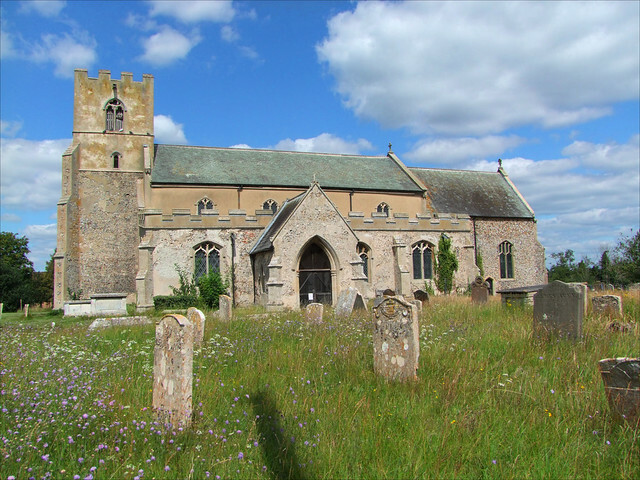 "Hello, my name is Simon Knott and I am very interested in taking some photographs of the inside of Tuddenham church. I understand that you are one of the churchwardens, and I'm wondering if you can tell me where I can borrow a key?" I earnestly enquired. This is my usual opening gambit. How could he fail to be charmed? He then did something very clever. He explained that he had the key, while at the same time also making it clear by the tone of his voice that he was reluctant to give it to me. I admit I was flustered. Panicking, I blurted out something about the Suffolk Churches Site, and he had me hooked. "So, is that some kind of commercial organisation then?" he wondered. Now, this is partly my fault. I assume any churchwarden in the east of the county will already know about the site, but out west, especially in the north west, the slough of suspicion I so often have to extricate myself from has put me off having too much to do with them. My chickens were coming home to roost. "No", I said, "the Suffolk Churches Site is a website about Suffolk churches, about my journey to visit them and photograph them..." I tailed off lamely, before I could say anything stupid about art terrorism or churchcrawling as guerrilla warfare. There was a pause, and then So, what youre saying is you want to photograph the inside of the church and then put it on the internet? he said. Ooh, this was clever. This made me sound as if I was up to no good. I tried a different angle. Well, so far Ive visited about 630 churches in Suffolk, and almost all of them have entries. Tuddenham is one of the last. Silence. I decided to play a high card. The Rural Dean knows all about it and he thinks its wonderful. I knew this, because he had told me so the previous week. He tried a different tack. Where have you come from today? he said. Now, what could I say? The question seemed entirely pointless, but if I wasnt careful I might not get to see the inside of Tuddenham church. So I did what I always do. I said I was from Burkino Faso. I didnt really. Im from Ipswich, I said. I interrupted quickly. If you like, we could bring the key back when weve finished with it. We usually do that, I added helpfully. If youre going to bring the key back then you might as well come and get it so that you know where to bring it back to! he replied, with a sense of comic timing. I felt that I was being played like a salmon. I glanced down at my piece of paper. Ok, youre at  and I named his address. well be there in two minutes. Silence again. It was at this point that I think he realised he was being stalked. But I had already switched my phone off triumphantly, and we leapt into DDs car. Sure enough, a couple of minutes later I was collecting the key from a nice man who was very cheery, although this might just have been because hed seen DDs Lotus Elise and knew we wouldnt fit many pitch pine benches in it. With the key safely in tow I allowed myself the luxury of a look around the outside while DD began setting up his scaffolding tower inside. In a county famed for the late medieval period, St Mary is that rare beast; a church with considerable evidence of the days before the Black Death sobered us all up. Not only is the tower a delight, but the decorated tracery in the windows on the south side and east end is gorgeous. The clerestory is a later addition; so late, in fact, that the north aisle that would have gone with it was never built. The Reformation got there first, but if it hadnt then we might have lost the wonderful sequence of Decorated windows in the north side, some of the finest in Suffolk. Of course, we did lose the glass. They must have looked wonderful. One curiosity is that a beam of the bell frame appears to be wedged in the south window of the tower. I always expect churches like this to be a bit musty and dusty inside, full of intriguing little details and forgotten treasures. Monk Soham springs to mind. Unfortunately, this was not to be. I stepped into a wide open space that had been almost entirely scoured. This must have been a fine church once, observed DD grimly. He was right. The battlemented entrance to the rood loft stair was a sign of what once might have been. The font, too, survives, on a mismatched base, but pretty much any other sign of the sacramental and devotional past life of this building has been completely lost to us. A great medieval treasure house destroyed by a combination of Anglicans, Puritans and Victorians. And it hasnt stopped yet. Across the expanse of that wonderful window tracery have been placed aluminium bar light fixings. They are almost deliberately ugly, although no doubt well-suited to the congregational worship these buildings nowadays host. High above, a handful of glum angels looked down, rather relieved to have survived the 1870 rebuilding of the roof perhaps, but wondering if it was worth it as they gaze at the Minton tiles. They were outnumbered by Victorian replacements, who looked smugger. The screen has gone, the chancel arch rebuilt. The pulpit survived the scouring, although it is rather less elaborate than many 17th century examples, and has been Victorianised on top. A curious and, under the circumstances, unlikely survival is the medieval door into the 19th century vestry. But thats about it. The east end of the nave was cleared and built up with stage blocks for a performance, which at least showed a bit of life in the place. As this was a Saturday, I assumed the church did not have a service the following day  either that, or the performance was that night, although I could see no sign of a poster advertising it. The west end of the nave was organised for post-service coffees and teas. I got the impression that the local parish found the medieval integrity of their building a hindrance rather than a help. The sky had become overcast while we were inside. I walked down away from the road, past the headstone of a young man who had died on the western front one spring morning in 1917. Just beyond this, an old man was quietly arranging flowers on a grave. Anxious not to intrude, I kept walking down to where the newer graves were beyond the fence, only to come across a young woman standing beside one of the newest headstones, sobbing and smoking a cigarette. Her grief seemed a mixture of anger and despair. I walked on; I hope she didn't notice me. I walked along the line of the newest headstones. It did nothing to cheer me up. There were plenty of older people lying there who probably lived rich and fulfilled lives, but several were to children, and even sadder were those to men and women cut off in their thirties and forties, leaving families and loved ones bereft. One man had left four young daughters. He was exactly my age, to the month. Goodbye Dad, never forget U, love U always said part of the inscription. The young woman had gone now, and I wandered along to where she had been standing. It was a stone for another young man, dead only for a few months. Perhaps this is the future for the Church of England. Sunday gatherings for the hopeful and faithful few, and the rest of the energy focused into hosting best-bib-and-tucker wedding ceremonies for those who want a fancy setting, and memorialising the local dead. Most other visitors I meet in churchyards these days are there to tend graves, or to stand and look at them. This modern cult of the dead seems in a generation or two to have entirely displaced the way people used to wander into churches to say a prayer and perhaps light a candle. Perhaps we should rename it the Church of the Dead, and just be done with it.